PandaTip: This dynamic table of contents will allow your client to navigate straight to specific sections of your proposal. If you add or delete sections, be sure to click “refresh” to update the table. Thank you for your interest in partnering with [Sender.Company] for your website development project. With well over 100,000 firms offering website development services, we know how challenging it can be to find the right agency for your web development needs. At [Sender.Company], we hold one goal above all others: 100% client satisfaction. Our in-house team of web designers, copywriters, graphic designers, and developers uphold the highest standards for project planning and execution, and we’re dedicated to building the perfect website for your company on-time and on-budget. In this proposal, you’ll find examples of our past work along with what we feel is the optimal solution for your website development needs, along with the associated delivery timeline, costs, and project terms. Once you’ve reviewed this proposal thoroughly, simply electronically sign it at the bottom to indicate your approval. Thanks again for the opportunity to earn your business! [Client.Company] requires a full website build to support your digital growth strategy. This website will allow you expose your brand to organic audiences via search engines, leverage digital advertising to boost lead generation, and deploy content marketing to build brand awareness and authority. [Sender.Company] is uniquely qualified to build the website that you desire, due to our in-house team of designers, writers, and developers, and our experience working with clients in [Client.Industry]. PandaTip: Don’t just tell your client that you build great websites – show them. Use the image fields in the template below to insert examples of your previous website development projects. PandaTip: This page is where you detail the work you’ll do for your client. Take the time to discuss the unique features their website will have, along with any additional services that you’re offering. We propose that your site be hosted with [Hosting.Provider] using [Hosting.Type]. This will ensure that your website is capable of supporting a high volume of traffic while remaining protected from malicious entities. These integrations will allow you to use your website as a profitable marketing tool which helps you generate new revenue for your business. PandaTip: PandaDoc’s tables allow you to communicate detailed data in a structured, easy-to-read way. This template includes two types of tables- standard and pricing. Take a minute to customize both to fit your needs. The following table details our projected execution timeline for your website development project. Disclaimer: The dates in the table above are estimates based on our experience with similar website development projects. While we strive to accurately estimate project timelines in every proposal, we reserve the right to move delivery dates in response to unforeseen delays or changes to project requirements. The table below details the costs associated with this project. Invoices will be sent to [Client.Company] on the dates indicated below, are payable via credit card or wire transfer, and are due on a net-30 basis. The table below details monthly fees which will begin once the website is successfully launched. Fees to [Sender.Company] are due in accordance with the above listed pricing table. Fees for monthly services will be invoices on the 1st business day of each calendar month, and are due on a net-30 basis. All payments will be made in [Sender.Currency]. [Sender.Company] reserves the right to assign subcontractors to this project to insure the right fit for the job as well as on-time completion. [Client.Company] may be charged additional fees if it decides to make changes to the agreed upon project scope and objectives. [Sender.Company] warrants that the functionality contained in this project will meet [Client.Company] requirements and that the operation will be reasonably error-free. The entire risk as to the quality and performance of the project is with [Client.Company]. In no event will [Sender.Company] be liable to [Client.Company] or any third party for any damages, including any lost profits, lost savings or other incidental, consequential or special damages arising out of the operation of or inability to operate the website, even if [Sender.Company] has been advised of the possibility of such damages. [Client.Company] represents to [Sender.Company] and unconditionally guarantees that any elements furnished to [Sender.Company]. 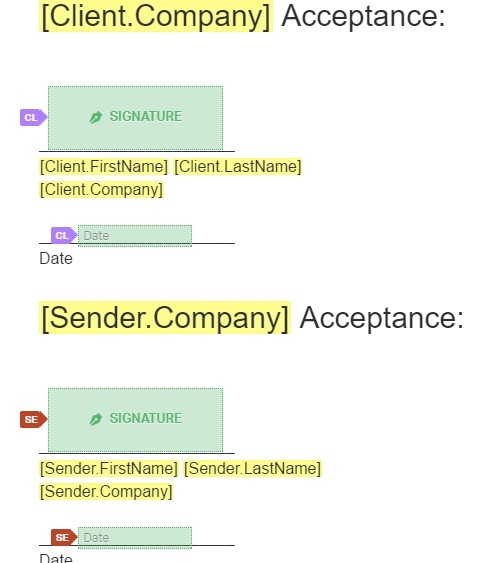 for inclusion in the project are owned by [Client.Company], or that [Client.Company] has permission from the rightful owner to use each of these elements, and will hold harmless, protect, and defend [Sender.Company] and its subcontractors from any claim or suit arising from the use of such elements furnished by [Client.Company]. [Sender.Company] guarantees that all aspects of design and construction of the project will be disclosed to [Client.Company] upon completion, and full code, copyrights and ownership will be the sole property of [Client.Company]. [Sender.Company] retains the right to display graphics and other design elements as examples of its work in its portfolio. The agreement contained in this Contract constitutes the sole agreement between [Sender.Company] and [Client.Company] regarding this project. Any additional work not specified in this contract must be authorized by a written change order. All prices specified in this contract will be honored for three (3) months after both parties sign this contract. Continued services after that time will require a new agreement. This agreement begins with an initial payment indicated in the pricing table above. If [Client.Company] halts work and applies for a refund within 4 days, work completed shall be billed at the hourly rate of [Hourly.Rate], and deducted from the initial payment, the balance of which shall be returned to [Client.Company]. If, at the time of the request for refund, work has been completed beyond the amount covered by the initial payment, [Client.Company] shall be liable to pay for all work completed at the hourly rate stated above. No portion of this initial payment will be refunded unless requested within 4 days of signing this contract. PandaTip: This proposal template will allow you and your client to sign on any computer, smartphone, or tablet. Just assign each recipient to the proper roles using the menu on the right and hit send when you’re done customizing the template!